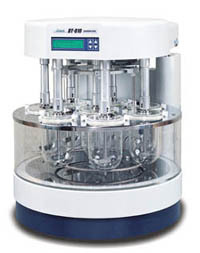 The model DT-810 dissolution Tester is fully automated and designed fot flexibility to provide dissolution testing of up to 8 samples with either the paddle method (standard) or the rotating basket method (option). The unique circular design provides uniform wafer temperature while utilizing a round heating element. The Direct-Center automatic centering mechanism provides hands-free positioning of the dissolution vessles and drive shafts for accurate dissolution tests with high reproducibility. all components can be controlled via PC using simple keystroke operations with a user friendly graphic interface. With a rapid pump speed, this system can collect or measure the absorbance of a testing solution in as little as 2 minutes. This system has high pumping volume accuracy and can dilute a collected solution by introducing a dilution solution from an external source. It also supports an 8-position automated filter changer. The analysis of dissolution samples by conventional spectrophotometers or conventional HPLC separations can require a large amount of time when analyzing the number of samples collected from a dissolution test. By utilizing UHPLC, the analysis time can be reduced from 1/5 to 1/10 the time required compared with conventional HPLC.